Series description: Phineas and Ferb know that with only one hundred and four days of summer vacation you've got to make every one count! Whether they're building a rocket or discovering an ancient mummy they're dedicated to making each mind-numbing rotation of the earth into something really special. While their sister Candace tries fruitlessly to reveal their crazy endeavors to their mom and Perry the Platypus is saving the world from the dangerous Dr. Doofenshmirtz Phineas and Ferb are filling their days with one adventure after another. Chapter Book #3: Wild Surprise What better time to be creative than a birthday? 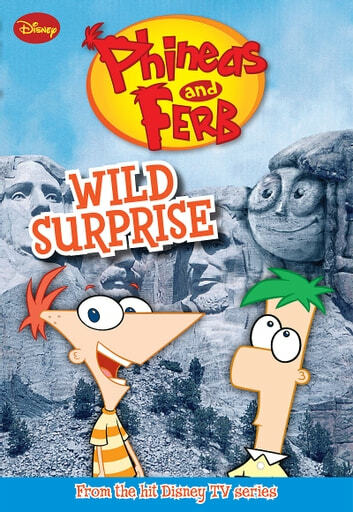 With gifts at stake Phineas and Ferb are at their best. First they surprise Candace by adding her head to Mt. Rushmore and then they cook up an even BIGGER surprise for their mom's birthday. With all these good intentions what could possibly go wrong? Meanwhile Dr. Doofenshmirtz has created a machine that will shrink everything he dislikes. Will this mean the end for Perry the Platypus? Wreck-It Ralph: I'm Gonna Wreck It! I love phineas and ferb and especially candace flynn.